I have news. I’m making a change to Stories To Tell. I am putting my focus on audio. I will no longer advertise book production as part of my services. Why would I cut out books? I love books, I really do. But I have some good reasons. Here are five of them. It’s more than words. More than stories even. The voice reveals our character, personality, and emotions. The voice is the first thing we hear in the womb and often hearing is the last sense to go before we depart this world. Joe Ann Taylor’s father, a WWII veteran, was interviewed in the 60s for an oral history project by the University of North Texas about his role as the “unknown soldier” during the Pearl Harbor attack. Taylor had never heard her father’s interview before. “My father had been dead 19 years, and I hadn't heard his voice in 19 years, and I sat out there in the garage in the car, and I just cried and listened to him talk." I can help you tell your life story using broadcast-quality gear, compassionate and expert interviewing skills, and professional editing techniques in less than half the time it takes to produce a book, without needing to hire a bunch of subcontractors to transcribe, copyedit, design, or print, and it costs less than half the amount of a book with the same amount of stories. A lot of clients reach out to me wanting to do a book at first, but once they learn the benefits of audio – even when they were ready to invest in a big budget book – they go with audio. Why? Because audio gives you so much more. I reviewed all the projects I’ve done for clients in the last four years and the projects I enjoyed the most were audio projects. Audio is just what I love. I can’t help it. It is where I started, first in the womb, then as a student at the Salt Institute, and now in my work with Stories To Tell. I just keep coming back to it. It’s not that I’m never going to take on another book project. In fact, I’m writing my own memoir and hope to publish it someday. I’m committed to curiosity and exploring creativity. Each year I take workshops on things like film, writing, and storytelling. I’m constantly seeking new ways to understand and tell stories. I love that about my work. Branding – this funny word that gets tossed around a lot among business people, marketing gurus, and solo-entrepreneurs. Branding is about sending a clear message and my message was getting too garbled. So I asked myself: What if I focused on just audio? I've been offering a lot to clients during the last four years: audio memoirs, books, oral history, live storytelling, memoir coaching, plus teaching oral history, teaching memoir writing...the list goes on and on. It gets tricky trying to explain it all, especially since there’s no easy title that everyone understands, like accountant or fitness coach. By simplifying my offerings I can simplify my message and reach more of the people who want to work with me. Oh, I wish I had met you before my mother/father/grandparent passed away. I’m so excited you do this work! I want to record my stories for my kids and grandkids. So on to the next audio chapter in Stories To Tell! I’d love it if you helped me to spread the word about what I do. Together we can save more stories, more history told by everyday people, more voices. We can build more bridges between generations, and more love and understanding among families, and, dare I dream, more love and understanding among the peoples of the world. Check out my new and improved website. I’ve revamped it to focus on – you guessed it – audio! I’d love it if you shared this post with a friend. Send me a shout-out on Facebook. Or “like” me! I do hope you’ll like me. Want this blog to come to your inbox? Subscribe baby! Want to hire me to save your stories? 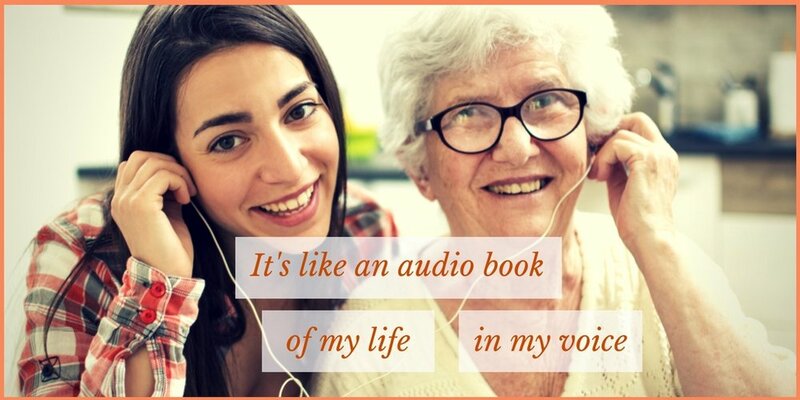 Check out my Audio Memoir services. Work for an organization and need storytelling help, oral histories, or professional audio production services? Check out Stories for Orgs.